Mozilla is not only a great browser but also a fully featured and powerful email client. It comes with great security and privacy, highly effective spam filtering and is still easy and fun to use. Mozilla manages multiple POP and IMAP email accounts. Mozilla sports flexible filters and message tags to sort and organize messages. Search toolbar, advanced search, and message views make it easy to find mail in Mozilla. Mozilla's highly effective Bayesian spam filtering moves junk to a special folder automatically. Mozilla supports TLS/SSL connections and S/MIME or PGP/MIME (via plug-in) message encryption. Richly formatted HTML messages can be displayed as full HTML, simple HTML or plain text. Mozilla comes with great HTML editing, but sending proper plain text emails is easy, too. The fully featured Mozilla address book supports vCards and Palm synchronization. 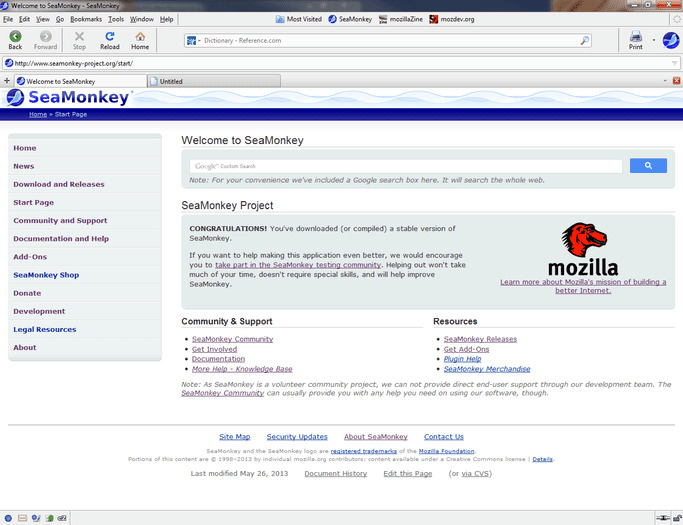 Mozilla supports Windows 9x/ME/2000/3/XP/Vista or higher, Mac OS X and Linux. Maybe you've read somewhere that Mozilla is "not for end users." Don't believe it. It was never true, and now it is less than ever. Getting, installing and using Mozilla is a snap, and there's so much about it to enjoy that you'll soon learn to love Mozilla, the email client. Mozilla is a fully featured email program with flexible filters, good IMAP support, powerful searching, strong HTML and plain text support, really useful free-form tags and views for prioritizing and organizing mail, S/MIME encryption and — probably most importantly — many great features that help maintain computer security and personal privacy.